Ms. Uribe is the newest addition to the Blue Room as the Lead Montessori Guide! 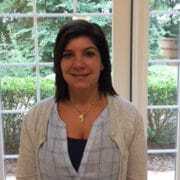 She will be working with Ms. Rubbina to spread the Montessori philosophy to her students. Ms. Uribe was born and raised in Lima, Peru and came to Atlanta in 1998. After earning her AMS certification in Primary from Florida Institute of Montessori Studies, she taught for four years in addition to teaching as a Spanish instructor. She has 2 sons with her husband Jaime and loves to learn new things!